In Korea, the city bus is one of the most convenient and readily available means of transportation. Throughout the country, city buses provide an easy way to reach any destination, with special colors or numbers to designate each route. Buses in Seoul are classified by color to differentiate the bus types: blue buses travel on major roads and run for relatively long distances through Seoul; green buses travel shorter distances and carry travelers between transfer points such as subway stations and longer bus routes; red buses are express buses that travel from Seoul to suburban areas; yellow buses operate on a closed circuit within a district of Seoul. 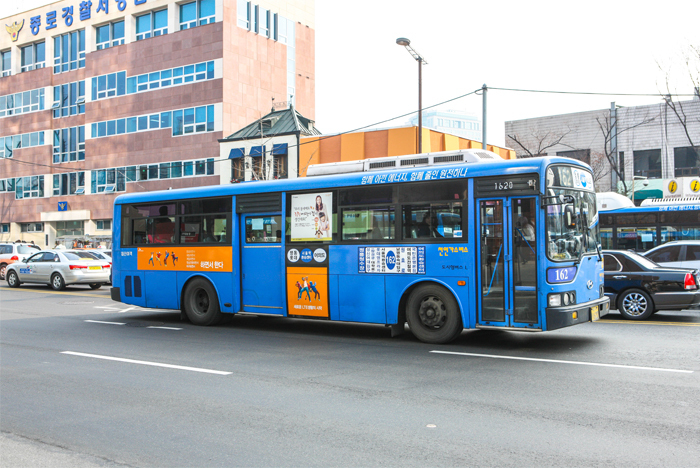 Promoting this efficient management system, many other regions in Korea have also introduced similar designated bus systems to ensure the punctuality of public transportation. Bus fare can be paid either by cash or transportation card when boarding. If using a transportation card, passengers can get a transfer discount when changing to the subway system or another bus line. To receive the discount, be sure to tap your card on the card reader by the exit doors before getting off the bus and you must transfer within the time limit which is 30 minutes. However, between 21:00-07:00, the time limit is extended to 1 hour. As passengers paying with cash cannot receive any transfer discount, it is highly recommended to use a transportation card. Eco-friendly electric buses effective in reducing air pollution can also be found in Seoul. These electric buses look similar to that of regular buses, with a green or blue exterior, but have a white outline on the top of the bus with a label that reads “Eco-friendly Electric Bus” in Korean. Bus fare and transfer discount apply the same as regular city buses. Korea not only has a great public transportation system but also a well-developed payment service that is widely accepted on buses, subways and taxis operating throughout the country. These transportation cards can be purchased from subway stations and convenience stores. The best part of this service is that it is available to all citizens and international visitors, allowing everyone who uses a transportation card to save 100 won on each trip, based on adult fare, compared to paying with cash, as well as receiving a discount when transferring.